So no “official” announcement has been made by the Mets as to if and when the Manager and General Manager will be fired. 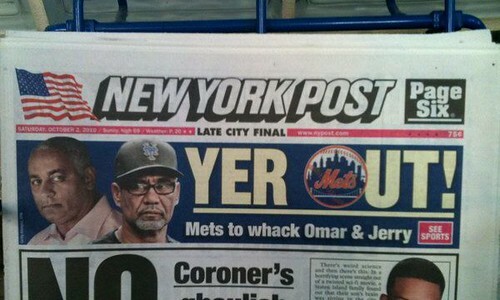 But… when you wake up to the NYPost reporting the story that both will be fired on Monday then it must be true. Right? The general feeling is these firings are long overdue and needed to bring back some integr-iousness to the Mets. If this were you or I, there’s usually some protocol as to when you would be told about your fate. For example, if you were doing a great job but unfortunately had to be laid off you would be given anywhere from 14 – 90 days advance notice. Maybe even more if you’re lucky. The employee could then use the time to transition to a new role or just come up with a reason to leave. Good reasons are, “I would like to explore new opportunities“, “I would like to take care of my sick grandmother“, “I would like to spend more time enjoying my vineyard“, “I would like to er, ah, uh do something uhh like integr-ious like“… something that says I’m happily moving on. If you were being fired for performance reasons, management would wait for the very last minute and ask the employee to pack up and leave immediately. File these terminations under the latter. Of course, nothing is official yet. These are all just assumptions. Right?